Who loads 16 ga. regularly? Thread: Who loads 16 ga. regularly? Ruger1980 is the gentleman's screen name that has the slugs. Rking22, there was a post that you are asking about. Unfortunately the gentleman wanted to sell his slugs in a manner that violates forum rules. I had to shut it down, sorry. You may be able to contact him via pm to see if he still has any. I bought the 375C I owned new back in the late 1980’s as a 16 gauge unit . I ordered the 10 gauge at the same time but at that time “they claimed the 10 was slightly different “ and needed a separate head . Dunno if that was true then or not . I do know that you can order a PW LS-1000 10 gauge add an extra $40 and they’ll set it up for 10 gauge 2 7/8” shells . Now I’d love to have one of those except for the price tag ! 6pt. My PW is from the late 70's. Before they were making the tapered final crimp dies. Just model 375. Now if you want 10ga dies it will come with the head attached. You can't just buy the dies, so its likely that there is something different about those 10 ga dies that they need a special head. My three 16 gauge loaders. Someday if I ever get resettled I'm getting a room thats 12' x 24' just for reloading with two 24ft long bench tops on opposite walls. Sooooo tired of having to carry an clamp all the presses be they shotshell or metallic presses to reload an then unclamp and carry back to closet. MOA , I am doing much t he same, fust smaller. I don't mind clamping them down to load, just want to have a handy place to store them. Keep two stations setup on the bench for shotshels. Seems I collect "junk" around things that dont get regular use. True, so true. Over all the years I've been doing this, only once, back in 91-92 did I have a dedicated space for reloading. All of 5 feet counter with storage underneath, and two tall cabinets one on the right and one on the left to keep components in. All the rest of the years its been clamping them down somewhere. Real PITA. When I was PW exclusively I had four 800C's and the 375C all bolted down on an oak conference table . It was quite nice not having to move stuff for sure . I'm using the same oak conference table now , but I have my PW Metallic II loader bolted in one spot , a CH-4D for the 505 Gibbs in another spot , a Lee Loadmaster for 45 ACP in another spot and a MEC jig thing bolted down for my conglomeration of MEC's . I've got I think 14 MEC loaders at the moment of which 4 or 5 need to find a new home . I'm perfectly satisfied at the moment with 9000's for the 12 , 16 , 20 and 28 . Also a Grabber for the 410 . And for my slug buck loads I'll keep the 10 Sizemaster , 12 Steelmaster , 12 , 16 and 20 600JR's . At some point I'd love to add a PW LS-1000 10 gauge factory set for 2 7/8" 10 gauge but $1000 for 10 gauge birdshot loads is kinda stout to say the least . Truth be known I'd love to do away with the 9000's and the Grabber and replace them with five PW 800 Plus's, but again that's darn near 5G's for those five machines new ! I will say for loading buck and slugs in the 10 , 12 , 16 and 20 I'm of the opinion it's easier to do them with a Sizemaster/Steelmaster rather then a PW 375C . I bought the 375C I had new in 89-91 I think . Got them at the Fairfax Rod and Gun Club in Manassas VA . I ordered the loader as a 16 gauge unit and had to buy a different head unit for the 10 gauge . I was loading 3 1/2" 10 gauge then rather than the 2 7/8" I load exclusively now . Well 6pt, looks like you have your hands full of shotshell loaders. It's a wonder I'm not in the same boat as you, I just love having good loaders. Start out basic and then you upgrade and can't get rid of the old loader. Can always find a reason to hold on to it or them. I'm thinking that I might want in the future to utilize a corner space in my future room with a 3 or 4 foot rotating bench top that I can mount the 4 Mec 600's to. That would eliminate the dead corner syndrome. Possibly even do something like that in each corner cause I know I have plenty of stuff to make that work real well. Just turn one corner into a tall floor to ceiling lazy susan for just the wads alone. Yup, I like that idea real well. I bought one of the MEC port things and it’s pretty easy to remove and mount any of the MEC loaders be it 600 , 650 , Sizemaster , Grabber or 9000 . MOA Your idea "with a 3 or 4 foot rotating bench top" !! Wow , I have been looking at a dead corner for twenty years and standing tall stuff in it and never gave it a thought how to use the space better. You could probably build several of those and sell them to people that are building new houses to just set in place and fit everything to it and maybe for just remodeling the reloading room.for others. Wow, that's a thought. And just think, I do a little part-time three days a week at a custom cabinet shop. Hmmmmmm. Might have to have a sit down with the boss and see about how we might do something like that so it can be boxed up and shipped via ups or fedex. 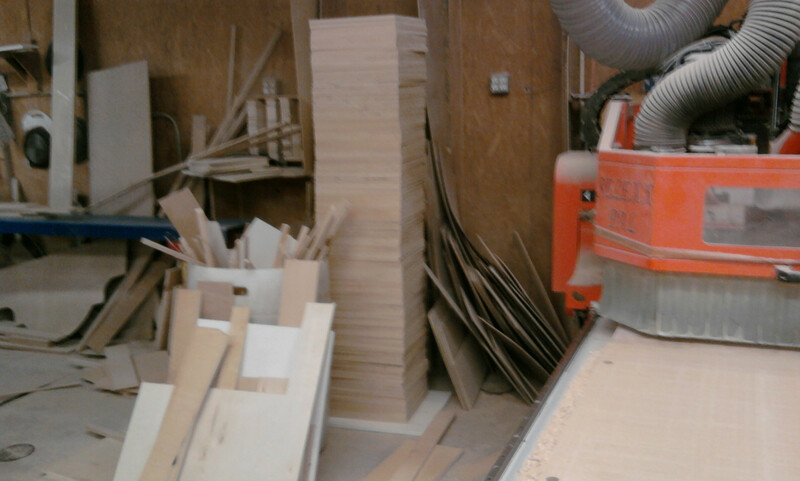 We have a cnc router that take a full sheet of plywood at a time for cutting out all the parts, hmmmmmm. Stay tuned, might just do something with that idea. OldBearHair, did you ever get up to Huntsville north of you to shop at the Academy store back in the early eighties, when they started carrying firearms and reloading stuff?